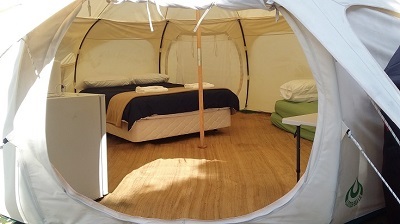 Auckland Council has introduced new glamping tents. 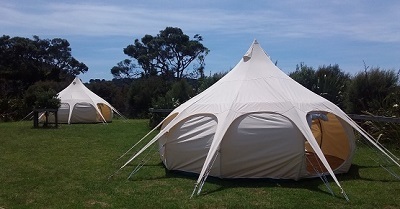 Furnished canvas bell tents are now available at the Orewa Beach Top 10 Holiday Park, Martins Bay Holiday Park and Wenderholm Regional Park, which promise hassle-free camping experience with comfort in amazing locations. Councillor and Chair of Auckland Council’s Environment and Community Committee Penny Hulse said that glamping helps to make camping in Auckland more accessible. “Glamping is a first for Auckland Council and adds to the Council’s portfolio of more than 100 holiday places across the region. It is great because it takes away the pressure of having to purchase and transport all the equipment needed to go camping. You essentially just need to bring your food and clothing. 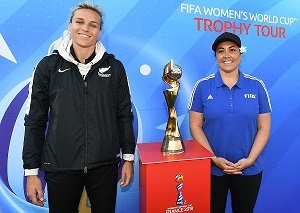 It is ideal for first-time campers and people keen on enjoying some of Auckland’s most beautiful locations,” she said. The glamping tents come furnished with a queen size bed plus single beds if required to accommodate up to two more, linen, table, chairs, kitchenette, BBQ, cooking utensils, nearby toilet facilities and fresh water supply. Orewa and Martins Bay provide a beachfront experience with all the holiday park amenities and services, while Wenderholm offers a more back-to-basics experience and is located on the edge of the estuary. Each tent caters for up to four people, with pricing dependent on location and number of guests. Auckland Council’s range of holiday spaces and accommodation includes 44 campgrounds on regional parks, 3 holiday parks, 31 baches, lodges and tramping huts, 22 self-contained parking areas, Waiheke Backpackers Hostel and additional holiday places sites leased through Panuku.